That’s Rosemary Schrager pictured above, a talented chef, television presenter and cookbook author who also runs her own cookery school. She is the face of National Baking Week, an initiative to get Britain baking, next week from 18th to 24th October. There’s going to be loads happening on on the National Baking Week website and here on The 21st Century Housewife and The 21st Century Housewife’s Kitchen as well. Baking is a wonderful thing to do for your family, and not only do you know exactly what is going into the food you are giving them, it can also help you save money too. And seriously, everyone can bake. There is honestly no great mystery to it, and as long as you follow the recipe you should get a good result. I’m going to be posting lots of recipes to get you inspired and there is even going to be a Giveaway sponsored by the lovely people at Pyrex. I’ll be giving more details about that on Monday so watch this space! In the meantime, I’ll leave you with Rosemary’s top four baking tips, and a lovely recipe for Easy Tea Time Cake made with Polenta, one of my favourite ingredients. 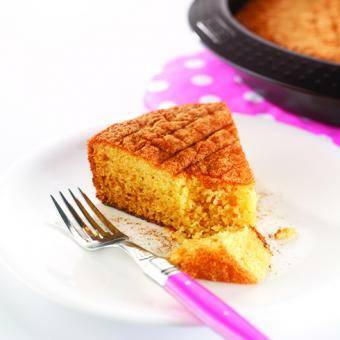 It gives the cake a gorgeous texture and a light, delicious flavour. 1. Pick something to bake that you really like or like the tastes of. 2. Establish and master basic baking skills, then move on – don’t try and run before you can walk. 3. Be patient and keep everything light to the touch. 4. Measure all your ingredients out prior to starting your baking. 1. Pre heat oven to 180ºC. 2. Mix sugar and cinnamon together in a Pyrex bowl and set aside. Butter the Pyrex Cake Tin and cover with the mixture of sugar and cinnamon, leaving no gaps. 3. Using a Kenwood blender, mix all ingredients together at medium speed. Pour into prepared Pyrex tin and bake in the centre of the oven for 45 minutes or until it is golden. For more delicious recipes, visit the National Baking Week website. And be sure to come back and visit me again for lots of great baking inspiration and the Pyrex competition! The 21st Century Housewife was not paid for this post. $85 (£60) CSN Stores Giveaway! What's Happening at The 21st Century Housewife?